Put a touch of magic in your ending. The last impression you leave of your writing rests on your closing thoughts, which will ring more loudly than the opening sentence that well may have gone forgotten halfway into your narrative. In my school years, I struggled not to copy my first paragraph in the last. With practice, I saw one way to dress the ending was to add a personal layer from my experiences. What is good writing? Fiction or not, it lives beyond its page. Relatable perspectives or stories will stay with the reader. And while an interesting plot or message serves as the architecture, paint it in dull, uniform colors and it won’t sell. So vivid pictures through to the end are another way to keep the words alive. The use of verbs I examined in The Writing Process, Part 3 becomes less an issue in the final sentence, a literal place that does not call for momentum. There, you want to bring your ideas to rest. Nouns and adjectives, then, can make the difference away from an insipid finish. How do you vivify nouns when they are often simply things, people, places? This is where metaphors and similes can shine. Before we look at a model piece of writing by Abraham Lincoln, I’d like to share its cultural context. In Amusing Ourselves to Death, Neil Postman describes how political debates ran longer than the advent of television began to allow. Americans stood through hours of each of the seven famous Lincoln-Douglas Debates. I believe Lincoln’s oratory skills sharpened him in the written word in a culture that Postman shows was more literate and less visual than ours. Public speaking remains an invaluable asset to the practice of writing for the challenge it presents in sustaining an audience. When you remove even the image of text from your audience so that your words are no longer read but only heard, you pull any vestige of distraction. Your words must stand on the merit of their content and the ability to engage listeners’ senses. I realize why the great orators from the conflagrant days of slavery in the U.S. wrote so brilliantly. An excellent speech is the hardest paper to write. The enunciated conclusion is the last snapshot of the speech the audience remembers. Back to the deliberate use of grammar in the stylistic craft of an ending to an essay, narrative, piece of fiction, poem, or post. 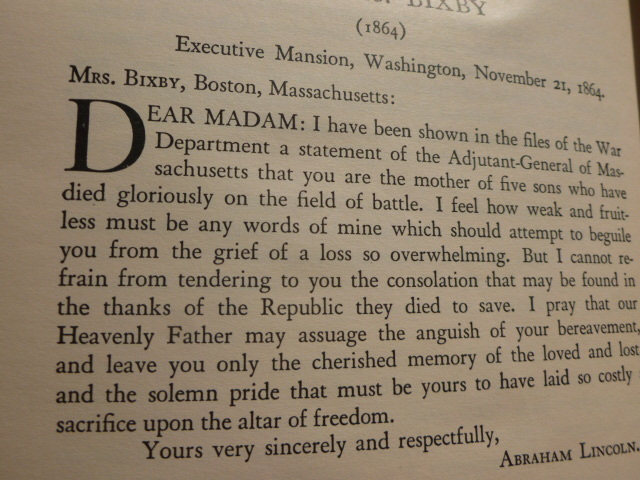 Lincoln’s letter of condolences to a mother who lost five sons in the Civil War demonstrates the full art of the parts of speech used well. Though Lincoln’s aim in the body of the missive was not the effects of verbs I’ve discussed, he did carry emotion and pictures in those verbs that propelled each sentence to the next. I feel how fruitless…to beguile you from the grief…But I cannot refrain from tendering to you the consolation…Now look out for the nouns in his concluding sentence: I pray that our Heavenly Father may assuage the anguish…and leave you only…the solemn pride that must be yours to have laid so costly a sacrifice upon the altar of freedom. In the final sentence of the letter, the lackluster verb to be that attributes the solemn pride to the woman is colored over by the descriptive nouns anguish and sacrifice, and the metaphor altar. Altar is where you give all. You see fire, death, blood, ashes. So often all you need is a word or two in that final sentence to provide a picture or feeling that continues to resonate in the spirit of the reader. A poem gives you a lot of room for a resounding note of provocation or beauty. In prose, you can also spin a unique, witty, funny, touching perspective. Employ a surprise or a pun. The blogger I quoted doubled back to his introductory assertion, “Ah, like life, water is a wonderful metaphor for writing” when he signed off by saying he needed to get in hot water as he pushes himself as a writer. The well-chosen noun or metaphor will not disappoint. In fact, subtle often beats anything amplified. One thing you don’t want to do in writing is overdo. Tacky. To return to our coloring analogy, a gentle stroke can bring your words to blush. This entry was posted in Arts, Blogging, Learning, Writing and tagged Creative Writing, English, History, Homeschool, Poem, Poetry, Words, Write, Writer, Writing Process, Writing Tips. Bookmark the permalink. You’re welcome. As with everything I write, I meant it – about your talent. I was glad to borrow your line. Had the draft down in chicken scratch when I remembered it. I really appreciate your taking the time to write this post. Other than high school english classes teaching writing and 1 college english class on writing, I have no education really to know how to write. I am always just trying my best to make it make sense and be somewhat grammatically correct. I will try to follow your suggestions! Thank you so much!! Fantastic! And now I’m freaked out about my colloquial grammar. You’ve been nominated by me for The Super Sweet Blogging Award! LOL LOL! I cannot tell you how many friends have expressed self-consciousness over their emails to me. I don’t police emails! Or colloquial exchanges!! I actually found a typo on one of my most popular posts (GASP) a day after publishing. (Yes, I was mortified beyond. Confessing so you feel better.) But human I am. I do thank you for the nomination. Uh, my turn to feel shy about placarding something like that. With the Shine On, I was given a list of rules and the logo to post on my blog. Any such things with the Super Sweet? Thank you- this is magnificent! I’m getting chills from your response!! YOU’ve been such an amazing supporter. And I really appreciate such clear feedback. I have no idea how each post affects someone — unless I’m told! I work hard at each one – this one, very much. Eloquence and simplicity at once, Abraham Lincoln! Thank you for this inspiring portrait, and for so gracefully crafting its lesson. I am glad to find your blog, look forward to coming back to read more (yes, new follower), and heading back to my blog now to do the refiner’s work! Inspired! Thank you!! !